Happy Tuesday! 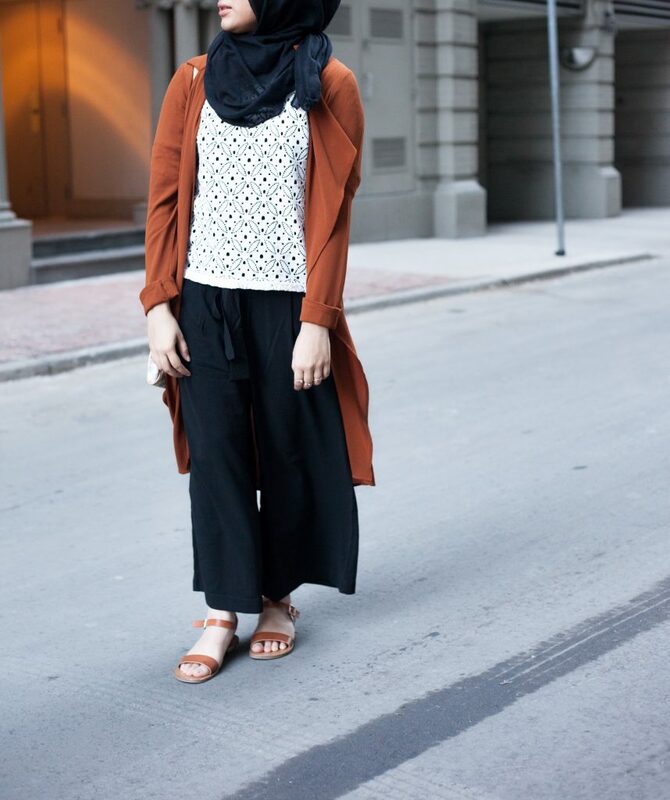 So, sometimes it’s very hard to find hijab friendly modest pants yet trendy. But, lately I’ve been obsessed with culottes and they are very IN this season. I can’t help myself but just style them with every outfit. They are just so comfortable and make every outfit look super presentable and modest. Every time I see culottes in a store, I have to buy them. But, why wouldn’t you? they are perfect and very hijab friendly. The fitting is loose and I always buy the full length culottes, that cover up to my ankles. 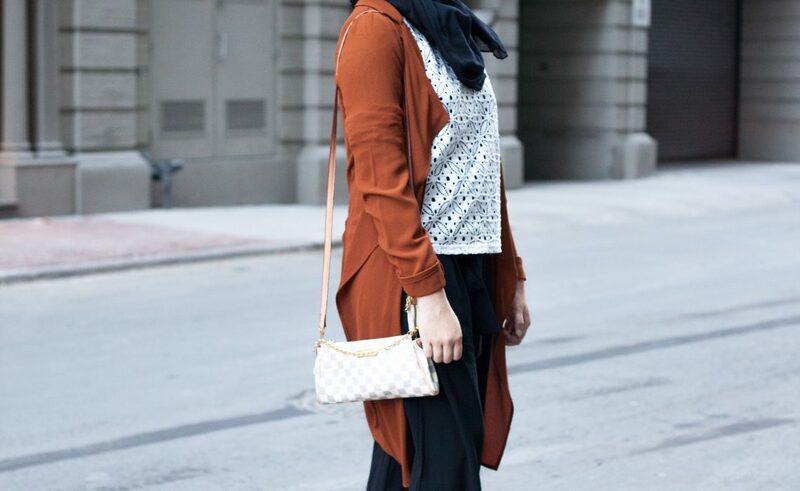 For this outfit, I styled it by wearing a white lace top and a rust colour long drape coat. I LOVE layering my outfits, and by doing this it really made the colour of this lightweight drape coat pop-up. This outfit is perfect for night-outs or even those casual events. As for the hijab colour I just went with black so all the colours could mix in together. Completely love it ! ? Always wanted to try wearing culottes but always felt nervous about them. Thanks for showing how to style them, kinda encouraged me to buy them even more. Will look into more ways to style culottes. Absolutely slayed this look! I love love love the whole look and the LV back just put it all together! Thank you for being an inspo for many Muslim ladies struggling to combine fashion and modesty together. Looking forward to your next blog post ? Your style is always on point ❤️?? I love the way you dress up and your dressing sense too. It is decent and above all modest not just by words, perfect for hijabis. Your whole outfit look is amazing. I love it how you can keep your clothes stylish and modest at the same time, and that’s why I find your outfits inspirational as I can relate to your fashion sense. Thank you Aliyah for the kind words 🙂 Keep an eye out for more blog posts hehe. For sure, they are perfect for the summer time! Yes you’re right, A must-have for all hijabis hehe!